Dinghy Transport – Safe travels! When you bring your boat to a regatta, training, holiday or somewhere else, it’s important to be well prepared before leaving. If you have an Optimist, Laser or other dinghy and transport it on your roof or on a trailer; the tips and tricks below are usefull for all. When you transport your boat on the roof of your car, it’s usefull to protect your roof rack against damaging your boat. Padded roof rack covers are available to protect your boat and give more grip in fastening your boat on the roof rack. The Optiparts padded roof rack protectors have a foam inner and are covered with heavy duty nylon cloth with velcro fastener. Easy to apply and to be placed in the right position. Length 50 cm. Sold per piece. To secure your dinghy to your trailer or roof rack, we advise to use long and durable load straps. To protect your hull against damaging, the Optiparts load straps have protection behind the buckle and are 6 meter long; long enough to put twice over your boat. During transport we advise to use a hull cover to protect your hull against chippings from the road. Nothing worse than arriving at a regatta and have damage to repair. The top quality hull covers from Optiparts and Windesign for Optimist and Laser are made of Moistureguard 2000; a heavy duty 900D breathable polyester cloth with a polyurethane membrane. Moistureguard reduces the risk of blisters. The hull covers are easy to install with the supplied straps and adjustable buckles. We all know that it’s easy to damage your Optimist and Laser foils. To protect your foils against having chips on the edges it’s recommended to use a foil bag for your rudder and daggerboard. 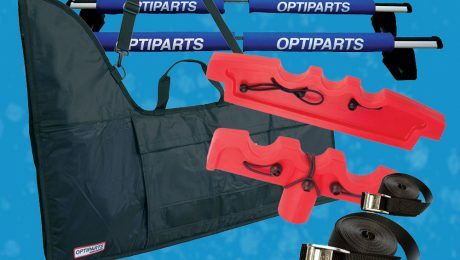 The Optiparts and Windesign foil bags for Optimist and Laser have seperate compartments for rudder, daggerboard, tiller and accessories like sheet, battens and wind indicator. Carried out with velcro closure, carrying handle and supplied with adjustable and detachable carrying strap. Don’t struggle anymore with fitting your spars in your car. With the Windesign Rig Support for Laser® you can easily take your Laser boom, top and bottom mast without damaging the deck during transport. The high grade plastic molded rig support comes in two pieces; the front piece fits in the masthole and the back piece fits between the deck. The Laser spars are fixed to the support with shockcord. In addition to the transport benefit, this rig support offers another benefit when storing your Laser; when placing your top cover over the rig support, your cover will stay upwards and the water will run off.